Mech Cadet Yu starts off in familiar territory. A room full of students is being lectured about the great hero Skip Tanaka, the first human being to befriend a giant robot, called “Robo Mechs” in this series, and defeat a race of giant monsters called the Sharg. Robo Mechs are alien robots that descend to Earth every four years, befriend a young child, and help them defend the planet against various threats. The cadets are going over the the history of Robo Mechs because it’s been four years since the last arrival, and today three of Earth’s best and brightest youngsters will meet their own Robo Mechs and fight the good fight. Listening in on all of this is our hero Stanford Yu, a young boy who loves giant robots and can’t wait to have one of his own. The only problem is the fact that Yu is not a cadet, but instead helps his mom with her janitorial duties around the compound. The actual cadets bully him and love to remind him that will never be one of the chosen elite. When the time comes for those cadets to meet their new partners, something goes wrong. The third Robo Mech is a no show, having apparently crashed a half mile away only to be discovered by Yu. Whether by chance, fate, or a programming error, the mech chooses Yu as his new partner. It looks like all will be well save for two big mysteries that pop up as a result that could have serious far-reaching consequences. 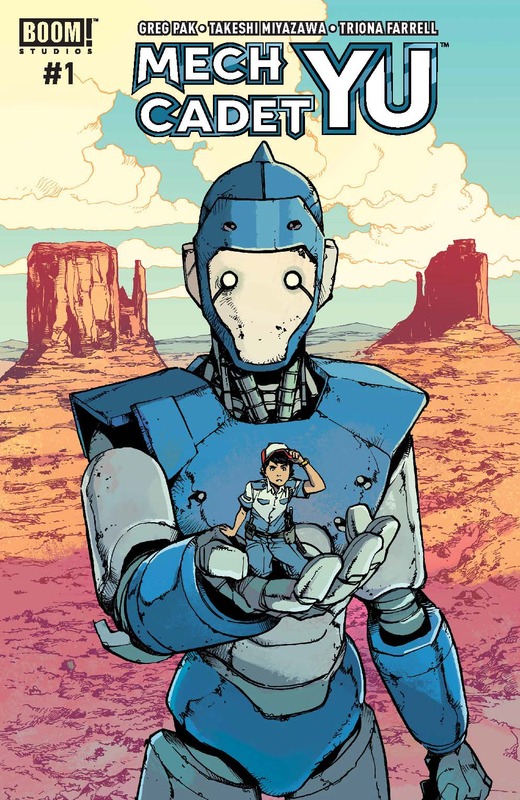 From Giant Robo: The Day the Earth Stood Still to The Iron Giant, some of my absolute favorite stories are about a young boy and his giant robot, so I was very excited to see Greg Pak and Takeshi Miyazawa’s take on the genre. I’ve loved Pak since his work on Planet Hulk and World War Hulk, and what I’ve seen from Miyazawa’s work on Runaways and Ms. Marvel, he’s the guy you want to get for Young Adult-leaning stories like this. Just like when I’m reading Lost Light or Mighty Morphin Power Rangers, I’m very critical of how comic artists draw mecha. I’m happy to say that Miyazawa knocked it out of the park. His designs are simple and distinct, which makes them easy to remember and desirable should they ever become toys (they should). Triona Farrell’s coloring complements the art well, adding vibrancy to the Arizona desert and boldness to the Robo Mechs. The first issue of an original comic has a lot of work to do in around 22 pages, but Pak pulls it off. We get a good feel for the characters and what drives them, especially Yu, and the two hooks at the end leave room for a much larger story. Mech Cadet Yu is the rare original Western mecha that could really take off. I’m just hoping its future is more Pacific Rim than Robot Jox.